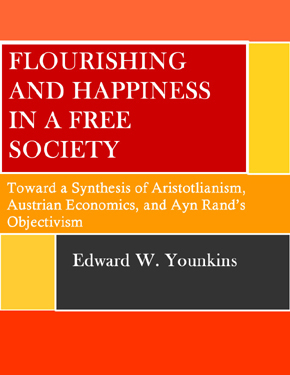 For much of the past decade, Dr. Edward Younkins has been busy synthesizing the ideas and approaches of some of history's most promising schools of thought, in an endeavor to, in his words, “present a broad brush outline of a potential philosophical foundation and edifice for a free society based on the natural law, natural rights, liberal tradition.” The culmination of this effort is his new book – Flourishing and Happiness in a Free Society: Toward a Synthesis of Aristotelianism, Austrian Economics, and Ayn Rand's Objectivism – forthcoming at the time of this review. This book condenses immense knowledge, inspiration, and guidance into under 150 pages and can serve as both an introduction to natural-law, natural-rights ideas for beginners and as a reflection and consideration of further steps to take for those who already study and apply these ideas extensively. This book is itself a synthesis of three of Dr. Younkins's articles, presented here as three chapters and tied together by an introduction that presents the philosophical and biographical backgrounds of the thinkers being considered and a conclusion that offers guidance as to how to infuse their ideas into the world of today. Chapter 1 – “Menger, Mises, Rand, and Beyond” – delves into the philosophical underpinnings of the Austrian School's intellectual giants: Carl Menger (1840-1921), Ludwig von Mises (1881-1973), and Murray Rothbard (1926-1995). From Menger's Aristotelian theory of value and attempts to ground value in an objective, biological basis; to Mises's neo-Kantian apriorism and subjective theory of economic value; to Rothbard's placement of natural law on a secular footing and return to an Aristotelian, broadly empirical view of the foundations of economic science – Younkins covers the major ideas animating the history and current development of the Austrian School of Economics. Ayn Rand's philosophy of Objectivism is presented as another fundamentally Aristotelian approach which is compatible with Austrian economics. In my view, one of Younkins's most pivotal points in this work is his extensive demonstration of the compatibility of subjectivity of economic values with objectivity of moral values. Economic value arises out of economic actors' actual preferences, irrespective of whether those preferences are the most desirable ones. Moral values are what should be pursued for an individual who desires survival and flourishing in a reality that is governed by objective biological, physical, and economic laws. Metalevel happiness requires a proper perspective that comes from the serenity or peace of mind one gets from knowing that: (1) one is free to rationally choose among alternatives; (2) a person’s potential for happiness is created in some particular way and with some particular nature which is not a matter of choice; and (3) nothing external can harm the core of one’s self. Serenity requires wisdom, a sense of proportion, and the ability to deal with pain and emotions in a balanced and rational manner. Happiness means being serene in the face of the unchangeable, courageous before the changeable, and wise enough to determine which is which. "Younkins is to be praised for investing much effort into emphasizing what many advocates of a rational, free society all too often forget: that there is a beautiful, rigorously consistent system of knowledge that unites them intellectually, even as they retain their differences in individual skills, personalities, areas of focus, and opinions on the finer points of theory and practice." On the subject of natural rights and their relationship to morality, Younkins's discussion clearly identifies the intellectual progress made in this area since the time of Aristotle, who was himself inconsistent about whether morality needed to be enforced by a governmental entity. The concept of rights as metanorms – offered by Den Uyl and Rasmussen – offers useful insights into the distinction between society-wide, legally enforceable natural rights and the personal sphere of moral decision-making. In short, “Natural rights are metanormative principles that regulate the conditions under which moral conduct and human flourishing can take place.” Natural rights establish the ground rules within which individuals can make efficacious moral choices as autonomous moral agents. Metanorms do not themselves bring about individual flourishing, since individuals also have the right to act immorally or otherwise sub-optimally as long as they do not initiate force against others. However, proper metanorms, such as natural rights, create the environment in which flourishing can be successfully pursued by large numbers of people. Another approach by Tibor Machan at the ethical foundations of natural rights is also discussed. To Machan, rights can be derived from rational egoism in ethics, as it is in an individual's rational self-interest to protect conditions that allow him to pursue his flourishing autonomously, without coercive interference. In Chapter 3 – “Toward the Development of a Paradigm of Human Flourishing in a Free Society” – Younkins's system-building endeavor comes to a climax. Insights from metaphysics, epistemology, ethics, economics, psychology, and politics are combined into an intellectual edifice with implications for everything from personal improvement to the nature and workings of a politically and economically free society. Ultimately, there are many fronts on which one can work to bring this integrated understanding closer to an everyday reality that is recognized and implemented by large numbers of people. Younkins's book should be read not just as an abstract academic treatise, but as a way of motivating improvements – incremental ones where necessary, radical ones where possible – in every aspect of theoretical and practical human endeavor. Younkins is to be praised for investing much effort into emphasizing what many advocates of a rational, free society all too often forget: that there is a beautiful, rigorously consistent system of knowledge that unites them intellectually, even as they retain their differences in individual skills, personalities, areas of focus, and opinions on the finer points of theory and practice. For someone who desires the kind of society-wide human flourishing, liberty, and rational advancement that Younkins describes, it should be clear upon reading this book that there is much left to be done, and much that can be done by individuals in any position in life. At the same time, Younkins's book has the potential to introduce many readers to the work of a plethora of wonderful, insightful thinkers, and to motivate a further, in-depth exploration of their works. Disclosure: The reviewer received a free copy of the book so as to produce a review in advance of publication.